When I was a kid, we had landlocked sockeye, aka Kokanee, salmon in our beautiful Flathead Lake, and in the fall when they’d run up the river to spawn, people would snag them when they tried to jump the small dam up-river. Because they would die after spawning, by this stage they weren’t much good cooked, but they were delicious smoked. During the regular fishing season, people caught many of these salmon, and froze them in paper milk cartons filled with water, to keep them from getting freezer burn. They were delicious throughout the winter, and leftover salmon made excellent bisque or chowder. I saw this recipe on Fine Cooking.com (1) and just had to give it a try, adapting it to use mostly cream instead of milk. I love salmon any way it is prepared, and right now we’re having sub-zero winter weather; a hot salmon chowder will just hit the spot. It calls for ‘hot-smoked’ salmon, which is cooked while being smoked – as opposed to remaining in the raw state like lox. My local grocer hot-smokes fish that approach their sell-by date. If you cannot find hot-smoked salmon, DO NOT use cold-smoked salmon (like lox), as it will not work in this recipe. Instead, try the next recipe (Wild Salmon Chowder), or cook some fresh salmon, or use leftover fresh salmon, and flake it as described in the recipe. I use a range for the amount of flour/starch, because don’t like my chowder too thick so I use the lower end of the range. Alternately, I could use the full amount and add more broth or water to make more chowder, but then I’d need more salmon. This recipe also includes leeks, potatoes and fresh dill. Mmm. The original serves 4; I’ve reduced it to serve 2. Prep veggies: Halve leek (white & light-green part only), rinse well between the layers, then slice thinly, enough to make ½ cup; thinly slice celery, enough to make 2 – 3 Tbsp, and combine with the leeks. Scrub potatoes, then slice into ½” dice, about 1 ¼ cups; set aside separately with the bay leaf. 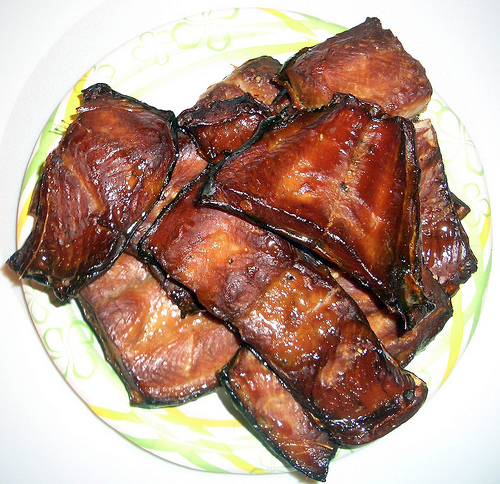 Prep salmon: Remove skin and bones from smoked salmon, then flake into bite-size pieces, about 1 ½ cups. Chop fresh dill, or measure dried dill weed, and add to salmon. Chowder: Melt butter in saucepan over medium heat. Add leeks and celery; cook, stirring about 6 minutes, until tender. Add flour/starch and stir to make a roux; cook 1 minutes. Measure milk and clam juice in 2-cup measure, then slowly whisk into the veggie-roux, and bring to a simmer. Add potatoes and bay leaf. and continue to simmer gently until potatoes are tender, 10-12 minutes. Measure cream in same measure, add dill and lemon juice. Add to saucepan with the salmon and cook about 1 minute, stirring, until heated through. Season to taste with salt and pepper. Serve. My friend Gayle in Austin, Texas, sent me a cookbook for my birthday: The Soup Peddler’s Slow & Difficult Soups. The author, David Ansel, lives in the same Austin neighborhood where Gayle recently bought a charming house. David asserts he titled his book as a rebellion against the “fast and easy” food craze that is leading our diets astray. So, for my birthday, I bought some wild king salmon, the last of the season, to try my first recipe from his book, and it was, of course, a hit. But I did make a few modifications. First, it is sized to serve a herd; I cut it in half. I couldn’t find fish stock in my local grocery, and I don’t have any fish heads, bones, etc. saved up to make my own, so I used clam juice and water (always a good substitute for fish stock, in a pinch). And I used much less of it because I didn’t want to dilute my salmon down to nothing. I didn’t have enough cream, so I used mostly whole milk enriched with a bit of cream. The result was wonderful. You can also use leftover cooked salmon, or cold-smoked salmon (lox), and flake it. This version serves 2-4. Double the salmon if serving as a main dish. I also include a single serving version (1 main dish serving or 2 side-dish servings). Chowder: Melt butter in saucier over medium-low heat. Add onion and saute about 5 minutes. Add chopped carrot and celery; cover and cook 10 minutes. Stir in flour/starch, then diced potato and fish stock. Increase heat to bring soup to a simmer, then reduce heat to maintain simmer and cook until potatoes are al dente, about 20 minutes. Remove all visible bones from salmon chunks/flakes; add to sauce pan with cream (or milk and cream mix). Simmer 5 minutes more. Do not let soup boil; just keep at a slow simmer. This entry was posted in Dairy, Fat or oil, Fish, Flour, Herbs, Root Veggie, Simmered, Starch, Stock, broth and tagged bay, cream, dill, fish stock, leeks, milk, potatoes, salmon. Bookmark the permalink.